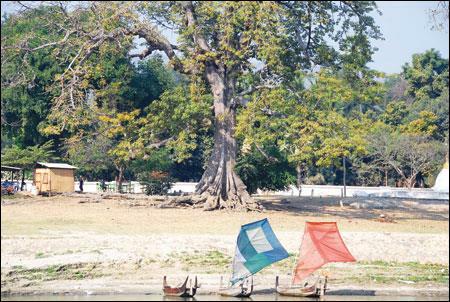 Not a popular tourist destination in Burma, Mingun is often mentioned in conjunction with Inwa and Sagaing as one of the ancient villages outside of Mandalay. However, one day coming to this riverside village left us with a lot of emotion and deep impression. Departing from the pier in Mandalay, we followed the Ayeyarwady River, a 2,170km long river that runs along the length of the country, to Mingun. The journey was fascinating from the start with the scenery on two sides of the river both strange and familiar. Familiar because it is only the daily life of the people living on the river. But in the pure sunlight in the morning, everything was fresh, as if filtered through a magical lens. Just a river but the scenery on two sides has very interesting differences. While the West Bank is adjacent to the center of the Mandalay city, with its high wooden stilts nestled amidst a lush greenery, the east bank is like a desert, with long golden boulders and huts. However, the point that the two sides have in common is the slow pace and leisure of the people. From the entrance of the village, the ancient Lapan tree (Bombax ceiba) stood like a giant guardian god. The breeze of tourism has more or less blown over here with stalls selling paintings, souvenirs. But luckily, the Mingun people still retain their idyllic village spirit. 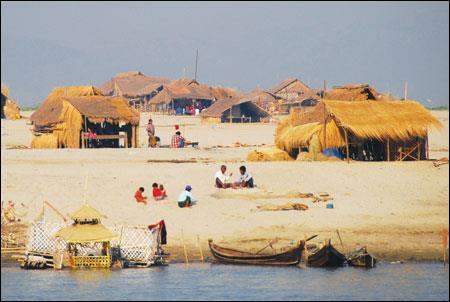 There is no scrambling for tourists, making tourism operation here is also a daily task, like fishing or fishing. You can explore the village by horse or cart, but after glancing at the simple map of the village, we decided to walk. 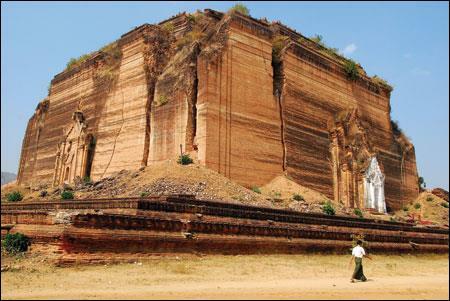 The first destination is the unfinished ruins of Mingun Temple, an ambitious project of King Bodawpaya. This huge temple was started in 1790 and was planned to be 150 meters high, but was stopped midway because of the prophecy: the king would die when the temple was built. Although never completed, the ruins remain as huge as a hill, enough for posterity to contemplate and admire. The huge cracks after the 1838 earthquake did not only destroy but also enhance the impression of this heritage. Not far from Mingun temple is the world's largest bell weighing 90 tons, molded separately for the temple but never used. Although you may have seen Hsinbyume Temple on the cover of the guidebook on Myanmar, you would still be impressed by the gentle touch of the beautiful temple. 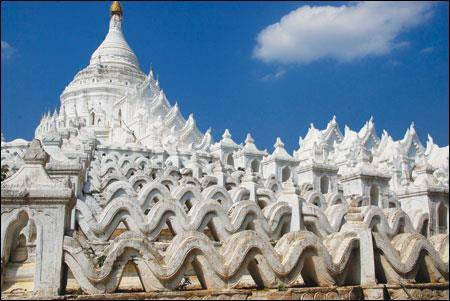 Named after Queen Hsinbyume, the temple was built by King Bagyidaw in 1816 to commemorate his wife. The architecture of the temple, modeled after the Mount Meru, is believed to be the center of the universe, with seven layers of curved white corridors symbolizing the seven surrounding mountains. You may climb to the top floor and enjoy the rare silence of the voyage and admire panoramic views of Mingun village along the Ayeyarwady River below. The river is like the people here, slow, gentle. On the river's edge, the giant rice plant leans against the water. And far away, the wooden boats with blue sails seem to stop at the light blue water on the horizon.